Cheese plate | Live people - live design! Cut the “Dor Blue” in squares of approx 3 x 3 cm. Place a half of the chives in boiling water and keep them under water for 3 minutes. Choose pieces of appropriate length. Tie them around the cheese pieces and serve on a plate. 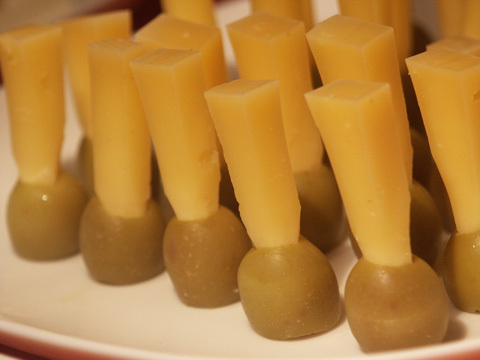 Cut the “Parmezan” into sticks and place them into the olives. Cut one end off of each olive to place them solidly on the plate. Cut the “Lappland” into strips of 2.5 x 10 cm. 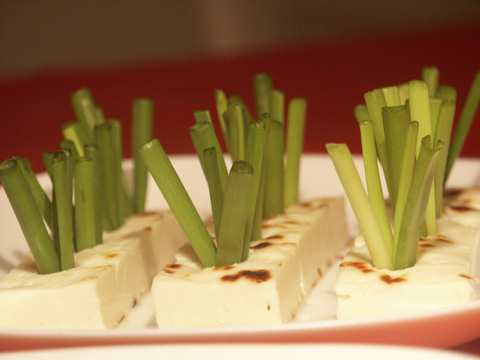 Insert a bunch of chives into prepared small holes in the cheese and repeat it after each 4 centimeters. The fourth plate consists of a mix of all previously mentioned cheese types and “Holland” cheese. Prepare squares of 3 x 3 cm from each cheese type. Make a small hole on the top of each piece and place one berry in the middle. Serve all four plates together. You are currently reading Cheese plate at Live people - live design!.